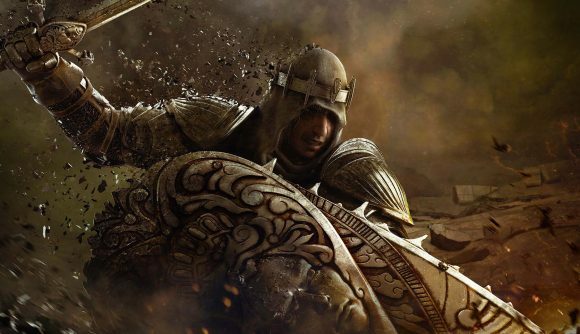 For Honor’s third year of updates is nearly upon us, and now we’ve got a look at Vortiger – the titular hero introduced in the first new season of 2019. He’s one of the Black Priors, a new class joining the Knights with this update, and he does battle with a longsword and kite shield. We’ve also got the first details on the new map coming in this update, as well as some hints at what balance changes to expect. Year of the Harbinger Season 1 starts on January 31. You’ll be able to play with the Black Prior immediately on that date if you’ve picked up the annual pass, or you can hold out until February 7th to pick him up with 15,000 in-game steel, as usual for the game’s new hero launches. For a properly grim and edgy look at Vortiger, check out the teaser trailer below – or through the UK mirror. The January 31 update will also bring us the new Dominion map, Harbor – a port town where the Black Priors once aided the Knights. The patch will offer some hero “improvements” focused on the Shukogi, Warlord, and Peacekeeper, though we don’t yet have details on exactly what those changes will entail. For Honor just wrapped up For the Creed, a massive crossover event with the Assassin’s Creed universe. Year of the Harbinger promises more reasons to come back with another three heroes set to launch over the course of 2019, along with new maps and further events.